Whether you’re painting a mutli-story dwelling or replacing windows in a high-rise building, we’ve got you covered. Our extensive range of aluminium scaffolding and access solutions means we can handle any situation and you don’t need to go anywhere else. You’ll always get the right system to suit your requirements. 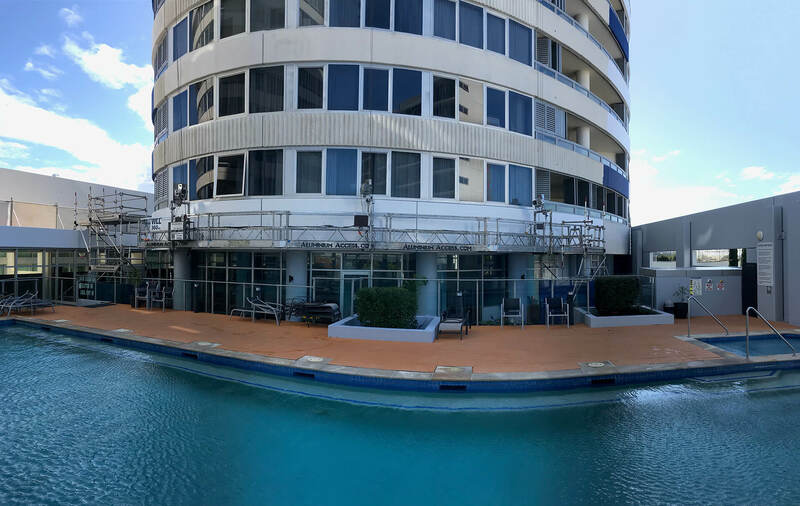 Our experienced teams service the greater Brisbane and Gold Coast region to provide quality aluminium scaffold hire. We pride ourselves on our ability to handle the toughest of access situations, keeping your people and your business safe. Whether you’ve been rebuffed by other scaffolding hire companies or just want to talk directly the experts first, get in touch with us today for a quote. When you’re working on a site with non-sheer walls, finding a scaffold hire company that will help can be difficult. But that’s where we excel. Whilst we still work on simple sites with no complexities whatsoever, we really love getting our hands on those odd-shaped jobs with tricky access requirements, the projects that other, less confident scaffolding companies pass up on. From high-rise swinging stages on rounded facades to tight indoors access such as cleaning brewery vats, we’ve yet to come across a job that we can’t handle. When you engage Aluminium Access Solutions for your next project, you’re getting more than just scaffolding. You’re getting access a team with over 35 years’ experience that knows what it takes to make a project successful. We focus on up front quoting that leaves no room for surprises, avoiding cutting corners in favour of a solution that will work safely and securely. After all, we believe that if it’s not safe, don’t do it. Alongside our realistic quoting comes our commitment to high quality installation done quickly and without fuss. We know that scaffolding is probably the furthest thing from your mind when deadlines are approaching, so we make sure to stick to our agreed schedules and let you focus on doing the work. And when that work is done, we’ll remove the scaffolding just as quickly as we erected it, getting out of your way and on to the next stage.